Marine reserves located near heavily populated areas are struggling to do their job but remain critical, a new study reveals. The study, published in the journal PNAS, analysed the effectiveness of different reef conservation strategies at 1,800 tropical coral reef sites around the world, some located near coastal populations, others further afield. For example, on reefs subject to high human pressure, marine reserves had five times more fish than openly fished reefs – a benefit that can spill over into the depleted fisheries in surrounding areas. “However, top predators such as sharks were a different kettle of fish,” said co-author Dr Aaron MacNeil from Dalhousie University. The scientists encountered top predators on less than 30% of their surveys conducted all across the globe, and very rarely in locations where human pressures were high. “You’d have to do about 200 dives to see a top predator in reserves with the highest human pressure. But where human pressure was low, you’d be likely to see predators more than half the time,” said Dr MacNeil. Dr Michele Barnes from the ARC Centre of Excellence for Coral Reef Studies at JCU said that in many places, social, economic, and cultural realities mean that marine reserves that entirely prohibit fishing are not an option. “We also looked at how effective other forms of reef conservation were, such as restricting the types of fishing gear that people use. Our results were promising – these restrictions certainly had better outcomes than doing nothing, but not as good as marine reserves. They were a sort of compromise,” she said. Professor Cinner said the study makes clear the benefits and limitations of implementing key coral reef conservation strategies in different types of locations. “Our research shows where managers will be able to maximise certain goals, such as sustaining top predators or improving the biomass of key fisheries species, and likewise, where they will be wasting their time,” he said. For the latest on the ocean, visit our News page. Take a look inside the latest issue of Oceanographic Magazine. 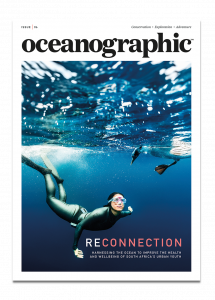 Oceanographic has teamed-up with ocean conservation charity Project AWARE® to offer FREE digital subscriptions. No cost, no catch.